Anyone who has used a computer for an extended period will know all about the side effects that come with it. After an all-night gaming marathon or an intense pro tournament, your eyes are likely reminiscent of the Sahara desert: dry, burning and blurry. Luckily, there is a solution in the form of gaming glasses. These glasses will help alleviate the painful symptoms that come with staring at a computer screen for an extended period. According to a study in 2012 and 2013 by The Vision Council, nearly 70 percent of all Americans suffer from some form of digital eye strain. Caused by staring at devices such as televisions and computers for hours on end, this strain can range from annoying to full-on pain. It’s no surprise that so many are suffering from this; according to the same survey, over 50 percent of Americans spend 6 or more hours staring at a screen on a regular basis. Eye strain isn’t the only health factor caused by staring at screens: The Vision Council also confirmed that dry eyes, blurred vision, headaches and even back and shoulder pain can occur as the result of staring mindlessly at a screen for hours on end. As the sun sets and natural light diminishes, usually between the hours of 6 p.m. to 9 p.m., digital eye strain as at its worst. Those headaches you get while playing games after work? Those aren’t work-related migraines; those are likely due to digital eye strain from staring at monitors for the entire course of the day. Over 60 percent of adults don’t know about this form of strain and are likely to attribute it to something else, which is why solutions to this problem aren’t more commonplace. Why does staring at a computer screen cause such a huge degree of irritation? The answer may shock you. In simple terms, the artificial blue light that computer and television screens output is harmful to your eyes when viewed for extended periods of time. Since we’re a society that now always stares at screens, our eyes have not adjusted or evolved to handle the artificial light in high doses. Also, most workplaces aren’t set up to alleviate eye strain; remember, over half of America’s population don’t even know digital eye strain exists. Luckily, there exists a way to combat digital eye strain so you can game without pain: A high-quality pair of gaming glasses. What Are the Benefits of Gaming Glasses? In layman’s terms, gaming glasses are shades designed for the sole purpose of reducing eye strain caused by computer and television screens. 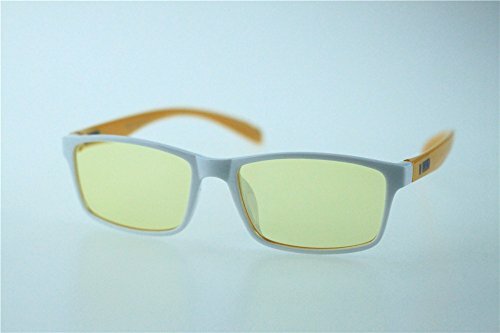 Gaming glasses feature a unique yellowish tint that offsets the artificial blue light that monitors produce and completely removing the strain of looking at a screen regardless of the length of time. Gaming glasses are the result of many years of scientific research, designed to give gamers a way to keep their eyes healthy: You’ll instantly notice the difference when you slip on a pair of gaming glasses and start to game. Many gaming glasses are both waterproof and scratchproof, ensuring that they will last you for at least one console generation, if not longer! No matter your age or gender, there is a pair of gaming glasses for you, with many manufacturers providing a plethora of options for men, women and children alike. If you consider yourself a gamer, these glasses are as much of a must-own accessory as an extra controller. Are There Prescription Gaming Glasses? If you already wear glasses, swapping out to a regular pair of gaming glasses isn’t going to help: You’re just going to trade digital eye strain for standard eye strain, if you can see at all. Luckily, many manufacturers of gaming glasses, such as GUNNAR, do provide prescription gaming glasses. The downside is that you’ll need to order these directly from the manufacturer after supplying a prescription or through a licensed optical retailer. Any pair of gaming glasses you order through a retailer such as Amazon will always be a non-prescription pair of gaming glasses. Are Gaming Glasses Just for Gamers? The term “gaming glasses” only refers to a small subset of specialized glasses; the broader term for the product is computer eyewear, and it’s usable by everyone. For example, non-gamers who work in an office setting can significantly benefit from a pair of computer eyewear, especially those who spend all day staring at a screen in a cubicle. In fact, some manufacturers of gaming glasses, such as GUNNAR, claim that these glasses can help improve productivity in the workplace due to filtering out fluorescent lighting. Keep in mind that gaming glasses isn’t just a fancy word for computer eyewear, and the two aren’t necessarily interchangeable; gaming glasses are specifically designed for the wider angles that video games utilize. While gaming glasses can double as a pair of computer eyewear, a pair of computer eyewear will not double as a pair of gaming glasses. In addition, many gaming glasses are specifically designed to be used with a headset or headphones, whereas computer eyewear is not. Are Gaming Glasses Just for Televisions and Computers? These days, gaming is everywhere; while previous generations were confined to television screens and monitors, today gamers can play games on anything with a display. Tablet, smartphones and even watches all have access to games and apps to play while on the go; luckily, your gaming glasses will also help reduce digital eye strain on these devices as well. If it has a screen and you can play games on it, gaming glasses will help combat eye strain. While you can wear your gaming glasses outside, be aware that they aren’t designed to provide protection from the sun. Many gaming glasses feature no UV protection and are only for indoor use. If you’re spending a considerable amount of time outdoors, it’s worth it to buy a dedicated pair of outdoor sunglasses and leave your gaming glasses at home. Now that you know the ins and outs of gaming glasses, it’s time to check out some products for yourself. Below is a chart and list of ten of the best gaming glasses on the market, guaranteed to eliminate digital eye strain when gaming. No matter which product you choose, you’re getting a high-quality pair of gaming glasses which will drastically improve your gaming experience. GUNNAR is one of the leader manufacturers of gaming glasses, and one look at the GUNNAR Optiks PHA-00101 MLG Phantom Full Rim Advanced Gaming Glasses will tell you why. The first thing you’ll notice is that these gaming glasses are stylish, sporting the type of sweet frames that you’d find on sunglasses from big name manufacturers like Oakley. These frames aren’t just for looks, as they are both comfortable and lightweight; GUNNAR states the glasses weigh only 25 grams, ensuring that both your eyes and face are free from pressure and irritation when wearing them. To round out the list of comfortability features are adjustable silicone nose pads. Once you try them on and fire up your favorite game, you’ll fall in love with the proprietary amber lens that GUNNAR uses. 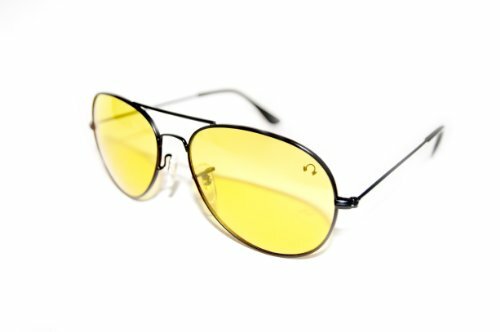 These lenses not only protect your eyes from blue light but also glare as well, and unlike other gaming glasses, the UV coating will even help protect against a minimal amount of sunlight. The filtered spectrum used on these gaming glasses replicates natural light even when looking directly into a television screen or monitor, virtually eliminating all digital eye strain. These gaming glasses are as strong as they are protective, with the frame made of high-tensile steel coupled with durable hinges. However, if something does go wrong with your GUNNAR gaming glasses, you’re protected by a one-year limited warranty. With both strength and protection in one package, you can’t go wrong with the GUNNAR Optiks PHA-00101 MLG Phantom Full Rim Advanced Gaming Glasses. For gamers who wear a regular set of glasses, buying a set of gaming glasses is a chore. First, you need to get a prescription, then either contact the gaming glasses manufacturer directly or find a licensed optical retailer who sells gaming glasses, often at higher-than-normal prices. 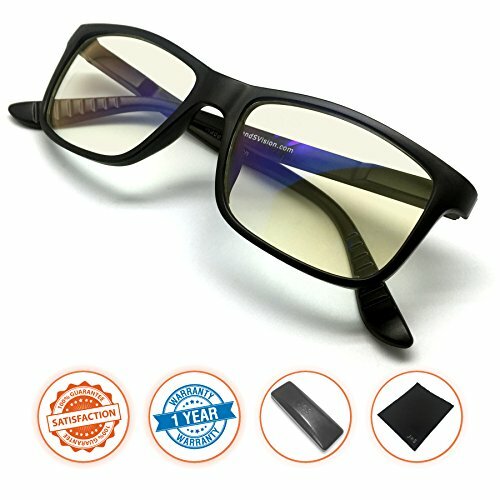 The Duco Optiks Ergonomic Advanced Computer Gaming Wear Over Prescription Glasses fit right over your existing prescription glasses, letting you save a load of cash while still protecting your eyes from digital eye strain. While you may think its uncomfortable to wear what is essentially two pairs of glasses at once, the Duco Optiks gaming glasses are so lightweight, you won’t ever realize you have them on. The Duco Optiks gaming glasses are as durable as they are protective, featuring a level of durability not seen in other gaming glasses. Duco Optiks claims that you can bend these glasses a full 90 degrees without having them break or even leaving stress marks. Also, while other gaming glasses are waterproof, Duco Optiks claims their glasses float when placed into water. The company is committed to making sure your shades are safe and remain in excellent shape; to ensure this, they include a glasses case, a cleaning cloth and even a glasses bag with every purchase. Don’t let the low-cost fool you; the NoScope ‘Wraith’ Computer / Video Gaming Glasses are an effective way to stop digital eye strain. These gaming glasses are just as good as their higher-priced competition, with features such as polycarbonate frames, resin-coated lenses and a high level of durability that helps keep them in top condition even after years of use. While other gaming glasses only feature an adjustable silicone nose pad, the NoScope ‘Wraith’ Computer / Video Gaming Glasses feature both temple and ear padding to provide maximum levels of comfort. 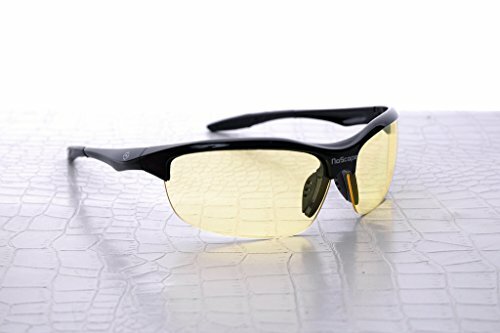 These gaming glasses are good for the eyes, and they are good looking as well; NoScope has gone to great lengths to ensure these glasses are stylish by using an aggressive design that fashionistas will love. NoScope created the NoScope ‘Wraith’ Computer / Video Gaming Glasses based on feedback from their previous gaming glasses, and it shows, as these are some of the best gaming glasses the company has put out. What makes the GUNNAR Optiks INT-00101 Intercept Full Rim Advanced Video Gaming Glasses different from the previous GUNNAR entry on this list? You’ll still find the proprietary amber lens and lightweight frame on this set of gaming glasses, but you’ll also find temple pads, rotational barrels and a long 18-millimeter bridge that will fit even the widest face. Last but not least, the external hard coat prevents scratches and will ensure your gaming glasses still look good as new even years after the initial purchase. What’s better than one pair of gaming glasses? Getting two pairs for the price of one! 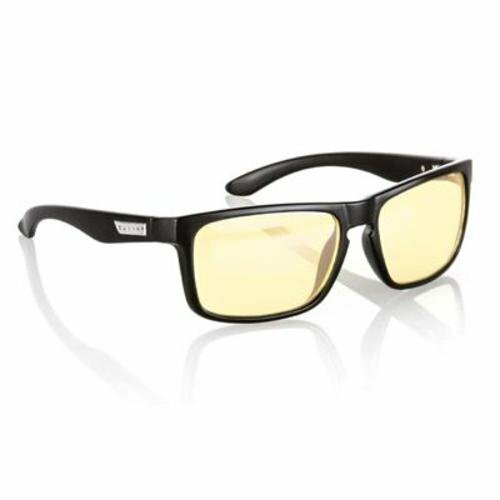 The Eyekepper SuperPak 2 Frame Computer and Gaming Eye Strain Relief Glasses Pack is a set of two gaming glasses, with one featuring a classic black frame and the other featuring a stylish beige frame. Rather than transport your precious gaming glasses to work and back, you can easily leave one pair at the office and the other at home. If getting two pairs of gaming glasses wasn’t enough, you’ll also get a free cleaning cloth and case with your purchase. The DUCO Optiks GX090 Matte Black Computer Glasses is one fantastic set of gaming glasses. Not only does this pair of gaming glasses fit all head sizes but the company claims that the glasses will not get in the way of your gaming headset as well. In addition to blocking the harsh blue light from your monitor or television screen, these glasses also prevent glare from reaching your eyes thanks to their anti-glare coating. The ultra-pure lens material found on the DUCO Optiks GX090 Matte Black Computer Glasses lets you see objects on the screen in sharper detail, enabling you to spot your enemies in-game from miles away. J+S is not as well known as brands like GUNNAR, but with products like the J+S Vision Blue Light Shield Computer Glasses, they are quickly making a name for themselves in the gaming glasses field. 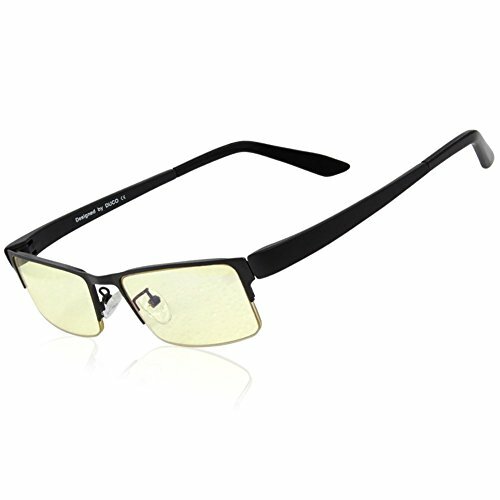 With their sleek silver frame, you may not even realize the Pardus Full Rim Advanced Computer Video Gaming Glasses are a set of gaming glasses at first. However, try them on and you’ll see that these gaming glasses are some of the best that money can buy. The yellow-tinted lenses block over 50 percent of harmful blue light rays while the tight fit on these glasses eliminates dry eyes. These glasses are lightweight, extremely comfortable and as an extra bonus, Pardus even throws in a free glasses case with every purchase. Did you spend all of your money on games but are looking for a pair of gaming glasses? What the Americana Made Distribution Gaming Computer Glasses sacrifice in looks, they more than make up for it in price. 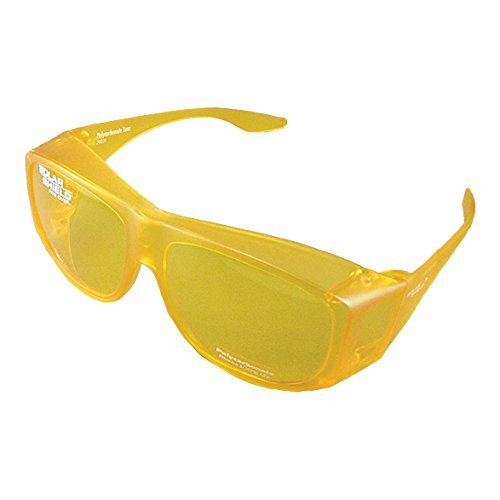 While these all-yellow gaming glasses will likely look ridiculous on your face, they provide high-quality blockage of both blue light and glare. These glasses are also extremely durable as well, with the manufacturer claiming that they are resistant to both impacts and scratches. Unlike most of the other gaming glasses on this list, you can wear the Americana Made Distribution Gaming Computer Glasses over your regular pair of glasses. While other gaming glasses focus mostly on televisions and computer screens, the ClearOptix Gaming Glasses is a pair of gaming glasses built around handheld gaming systems such as the Nintendo 3DS. While the majority of gaming glasses aren’t designed for outdoor use, the ClearOptix Gaming Glasses helps reflect blue light while also taking into account the overhead sun: perfect for gamers who love to play the 3DS and other handheld systems outside. You’ll need a strong set of gaming glasses when traveling, and luckily these rugged gaming glasses are scratch resistant and can shrug off impact damage as well. Not only will these gaming glasses reduce eye strain but ClearOptix claims they will increase your gaming skills as well. The rounded frames and silicone nose pads provide a high level of comfort; even after hours of gaming, you won’t feel any discomfort on any part of your face.